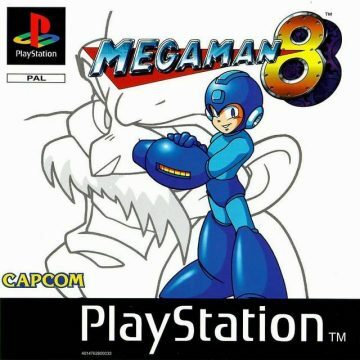 It wasn’t long after the jump to 16 bits that the classic Mega Man series leapt again to the new major console powerhouses of the time. 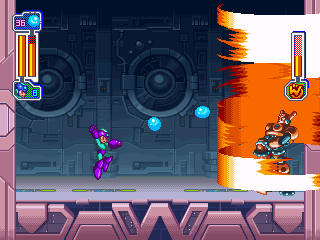 Being the first originally produced 32-bit Mega Man game (Mega Man X3 receiving ports to PlayStation and Saturn earlier the same year, but was first released on the SNES), Capcom was able to show off more color, sprites, and animation. 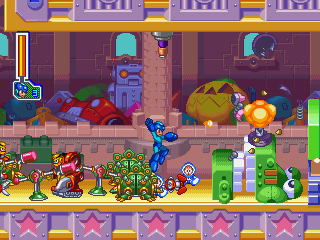 The added resolution and rescaling of Mega Man and his foes helped broaden the screen field back to original form from the previous game’s more cramped view. 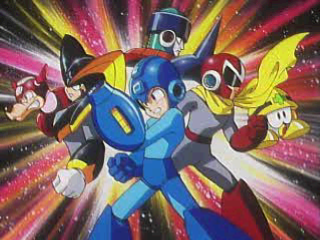 The CD-ROM offered plenty of space for voice clips from Mega Man, the bosses and more, along with nearly 14 minutes worth of animated FMV cutscenes produced by Xebec Inc. There’s a much bigger push to invoke a grander story this time around. Far out in the vast reaches of space, possibly eons past, two robots clash together in battle, only to injure each other to the point they can no longer fight. They drift through space until they crash land on Earth. 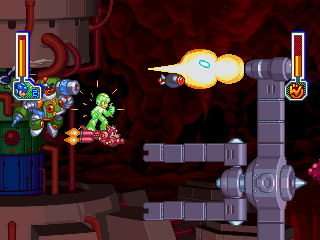 One of the robots is Duo, a warrior for good in the universe. 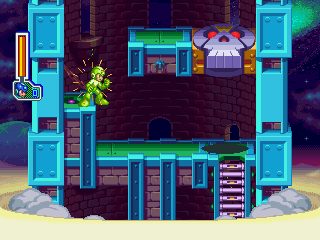 The other robot goes unnamed, but harbors an evil purplish energy source (even making a sinister skull shape) that Wily snatches up and and uses to power his latest batch of Robot Masters and protect his underground fortress with a barrier. 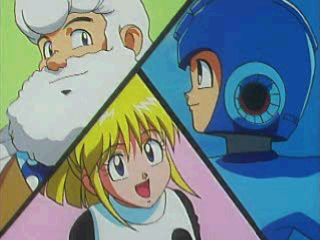 The most well-known aspect of Mega Man 8 is also its most notorious: the English dubbed voice acting. Capcom hired English speakers from around Japan’s metro area. Such vocal “talents” range from badly delivered muffled lines for Tengu Man, Sword Man and Bass to annoying, high-pitched squeaks from Clown Man and Aqua Man. Duo’s voice has no power behind it whatsoever, sounding whispy and drowned out by the BGM. 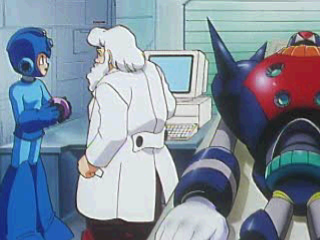 The most laughable of all is Dr. Light, who seems to be inflicted with the same speech impediment as Elmer Fudd and even stumbles over his readings a few times in the cutscenes. 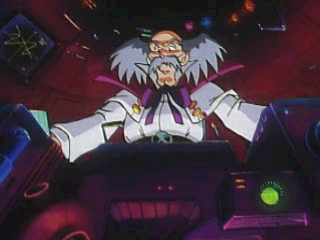 The only decent roles are from a fittingly maniacal Dr. Wily and a solid performance for Roll. Interestingly, the English dubbed woofs for Rush are better acted than the Japanese modulated barks. 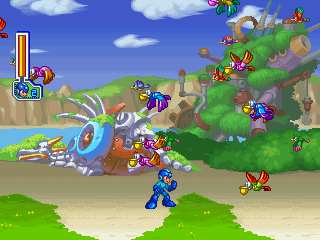 Capcom made the most out of the 32-bit tech in terms of graphics. 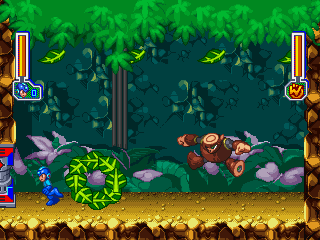 The backgrounds are lush and detailed and the animation of the sprites are fluid. 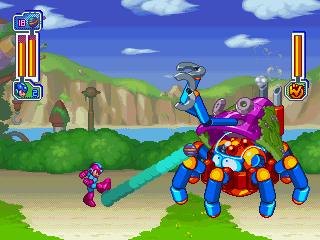 Even as mechanical robots, many of the characters employ plenty of squash-and-stretch animations in their motions. 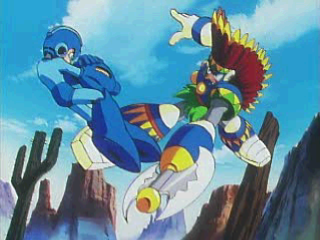 It is an excellent example for the level of expertise in Capcom’s 2D art during the latter half of the 90s. 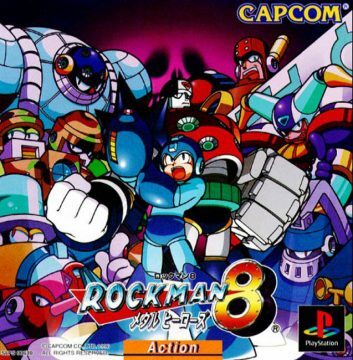 This was the kind of Mega Man game that only the newer consoles could achieve, and Mega Man 8 revels in it. 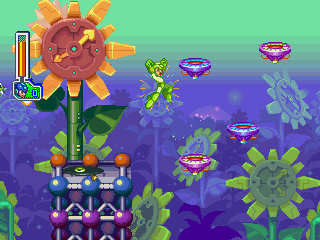 The only major caveat is the shift to a 3/4 perspective for the levels, which leaves the edge of platforms a bit more ambiguous to those reared on the tried-and-true visual cues of the earlier titles (standing firm with one foot dangling in the air). 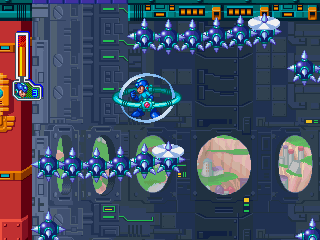 The limitations of the CD-ROM meant not only load times, but also the need to section off segments of each level, causing a definitive split between both halfs of each stage, many wildly shifting in tone. 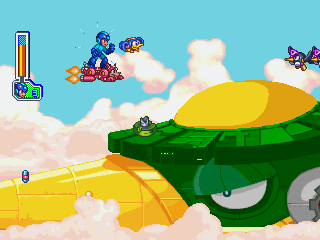 A fun addition to the gameplay are horizontal shoot-em-up segments where Mega Man takes to the skies on a Rush Jet. 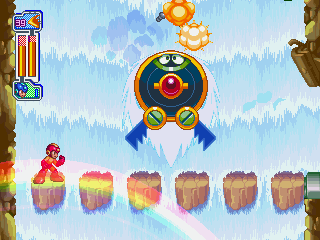 Prize capsules contain power-ups that call upon robotic pals to add their firepower: Auto with his fireworks cannon, Eddie dropping bombs like Gradius spread bombs, Beat homing in on enemies, and even a 3-way shot from his mouth for Rush. 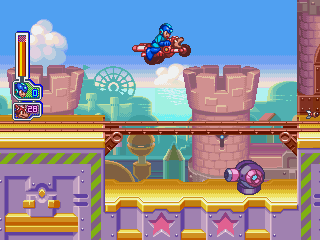 Special weapons can also be used along the ride. 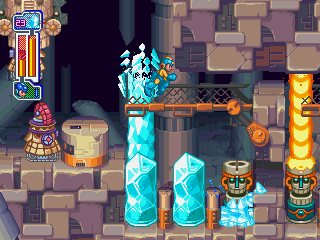 Unfortunately this diversion from the platforming is only used twice in the game, and is overshadowed by the more infamous three sled rides where warnings to “JUMP! JUMP!” and “SLIDE! 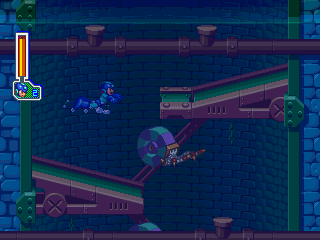 SLIDE!” proceed pitfalls and spikes, along with bustable barriers and swift enemies. 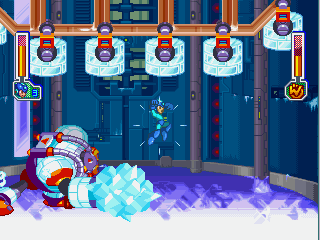 Here, a collision forces Mega Man to restart the whole trip down from scratch. 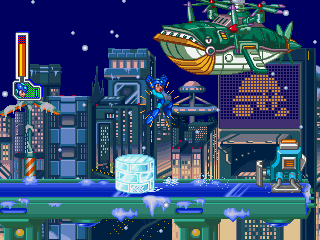 Also underused but an odd gameplay change is Mega Man’s ability to swim in water (obviously earning the Butterfly Stroke from Swim Man before the events of the game), which only gets some sparse usage in a skippable segment of the intro stage and half of Aqua Man’s level. 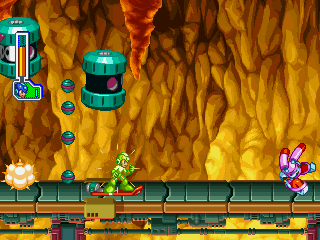 Again, many boss weapons have interactions with the stages, and the first four are put to the test in Sword Man’s level, required to reach the second act. 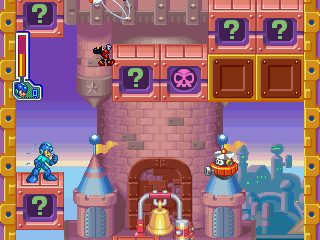 Likewise, many stages are based around annoying tricks like Clown Man’s box suprises to stand on and Astro Man’s shifting mirage platforms, both levels ending with mazes to traverse. 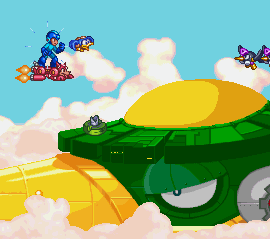 It’s almost like Capcom was trying all they could to make each stage unique, no matter whether it works or not. The weapons shine once again in this installment. 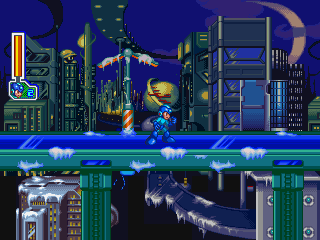 The Ice Wave does the ground attack great justice with its fast speed and freezing prowess. 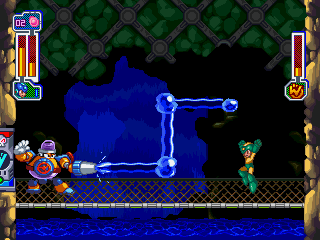 Flash Bombs cause big blows with multi-hit capabilites. 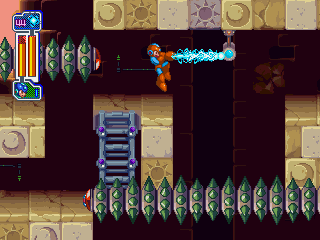 The Thunder Claw allows Mega Man to swing on nails in stages. The Tornado Hold allows for a boost into the air wherever it’s placed. There are many barriers to destroy with the right tool, making it worth the while to revisit stages and find goodies like the Screws. 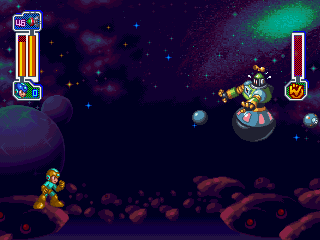 The added Mega Ball weapon handed in the intro stage is mostly useful as a high-jumping springboard, as it is difficult to line its shots properly, especially for a Wily Fortress boss you can only hit by kicking the ball at the right enemy above. Unfortunately, Rush’s new forms are pretty much a dud this time, and his Rush Item is a weak substitute for the lack of E-Tanks. Roll mans the shop at Light’s Lab this time, but with so little Screws to obtain and so much to buy, you’ll have to choose wisely, and not all items in the shop are created equal. Why pay to climb ladders faster when you can make your charge shots travel faster for the same price? 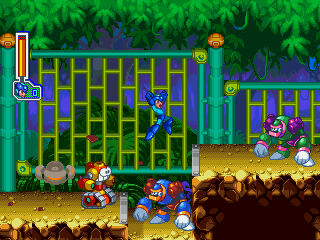 With the classic series entering its 10th year at the time of this title’s release, it appeared that the ol’ Blue Bomber was stuck in a form of video game mascot mid-life crisis. 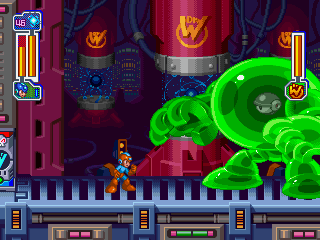 With the push for newer add-ons, gimmicks, and a spin-off series that was already reaching its third iteration, it was fast becoming difficult to decipher what made Mega Man what it was. Plus the pressure to shift all franchises to the third dimension left this classic Capcom icon without a safe avenue to call home, finding itself stuck in spinoff and cameo limbo. 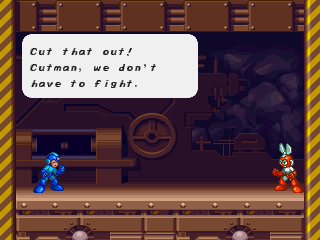 It seemed as though there was no place for classic Mega Man anymore. 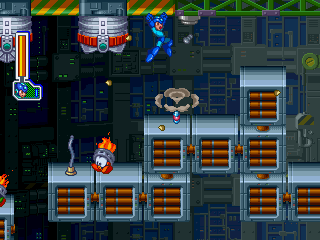 The Boss design contest for Mega Man 8 ran differently than for the previous games. Aside from limiting the amount of winners due to pre-building two of the Robot Masters, three of the designs to submit were to be based on three given skeletal frameworks: Swordarm + separated torso bot (who became Sword Man), Longarm bot (Clown Man), and two-headed bot (Search Man). Thanks to the data volume on the CD-ROM, the final sprites are shown side-by-side with the scans of the winners’ submitted art, along with the art of the runner-up submissions. This would be the last contest for the classic series, with the rest of the Robot Masters created in-house or from commission artists. 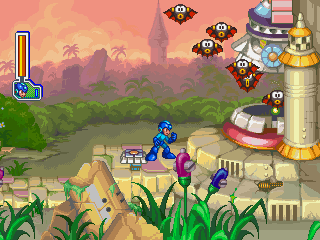 However, a few fan designs were used in later Mega Man titles, though only for the despised Xover and the cancelled Legends 3. 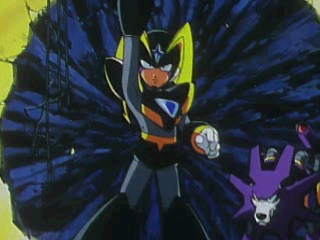 The Japanese version, aside from having much better acted Japanese voiceovers, contains opening and ending themes performed by Ganasia. Their licensed music was replaced with in-house instrumental tracks, which were also available on the Japanese soundtrack. 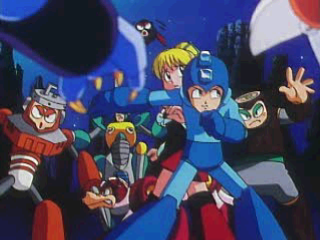 The Japanese PlayStation release also had bonus preview videos for the upcoming Battle & Chase and Super Adventure Rockman. 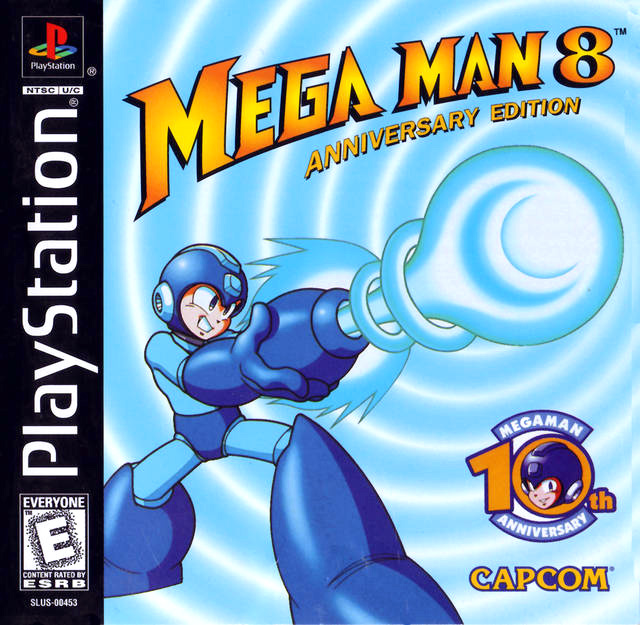 Despite being developed with the Saturn in mind, Mega Man 8 didn’t arrive on Sega’s 32-bit console until a month after the PlayStation release. 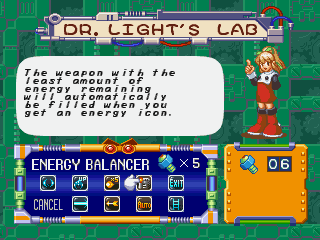 Though both look almost exactly the same, the Saturn version is the definitive experience, thanks to its extras. 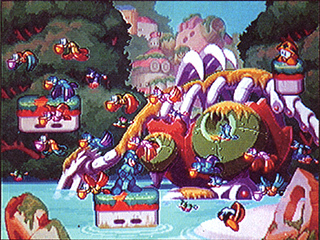 An additional menu option contains official and fan artwork that showcases many robot master designs that didn’t make the cut, each shown without a name but with a little blurb from a super-deformed Dr. Wily. 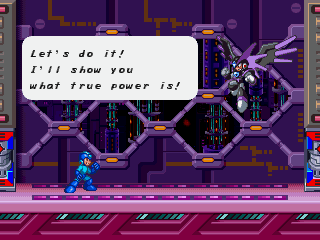 Along with Music and Voice sound tests, a code given at the end of the game allows to watch all the FMVs at leisure. 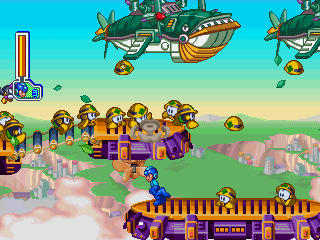 The Saturn version also adds more enemies on screen at many parts of the game, along with a few added visual effects like klaxon sirens and more flying birds and debris. 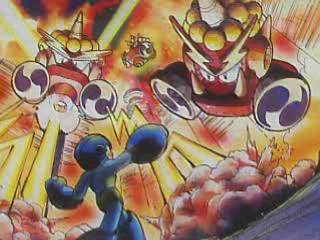 There are also hidden bonus battles against Cut Man and Wood Man, complete with remixed musical themes and voice acting, though they only guard bolts and don’t give up their special weapons. Tengu Man’s stage music is entirely different, though preference to either composition is up to the listener to decide. 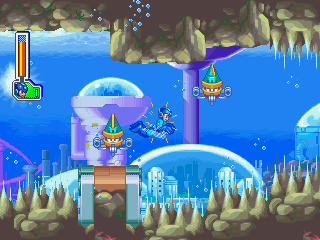 Aqua Man’s and other underwater segments lack the translucency that the PlayStation version has, but adds rippling wave effect instead. On the downside, the video quality plays on a slightly more compressed codec, making it a tad blockier in areas. The US release of the Saturn version is quite rare. Worse yet, the European market never received the Saturn edition at all. The PlayStation version garnered a Greatest Hits re-release. Sadly, the 10th anniversary mini art booklet included with the initial print run was removed. All ports and re-releases use the PlayStation as the basis, without the added content. 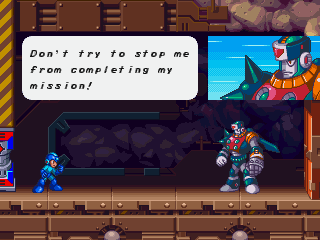 The Anniversary Collection‘s port suffers from audio issues ranging from distortedly loud sound effects to warped high-pitched voice samples during boss battles, making many of the grating performances even more annoying. In 2011, two prototype builds were leaked on the internet. One is just shy of being alpha stage for its contents, or lack thereof. 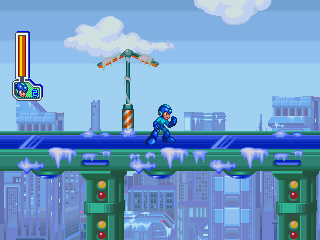 The bigger differences are the early names for the special weapons, some beta music that was removed, a different voice for Mega Man, and a vastly different background for Frost Man’s stage. Screenshots of the earlier build made their way into a few preview articles in gaming magazines, along with trade show alpha shots showing a robot dinosaur covered in moss in a version of the intro stage.